Evan Abla & Julia Roat-Abla: Why Didn't Anyone Tell Me This Before? Why Didn't Anyone Tell Me This Before? I have been reading Kenneth Scott Latourette's A History of Christianity: Beginnings to 1500 and read that King Herod was not even Jewish. I had always assumed that he was not only of Jewish stock, but also a descendant, albeit distant, of David. Poor assumption on my part. Apparently he got lucky and married into the Maccabeean family. There he set up a deal with the Romans and appointed himself King of Israel. Of course we all know he rebuilt the temple and everyone lived happily ever after. Well, actually he killed his wife and at least two of his children, his brother in-law, another wife, the other wife's mother, and possible several others just to stay in power, and everyone pretty much hated him, so really no one lived happily ever after. Anyway, I write all this because I didn't know it before. I didn't know Herod was a Maccabeean wannabe with no real right to the throne. 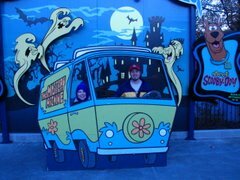 No one told me and it really would have made a lot more sense with the whole scared of Jesus thing. No wonder he killed all those babies in Bethlehem. Very interesting nonetheless. 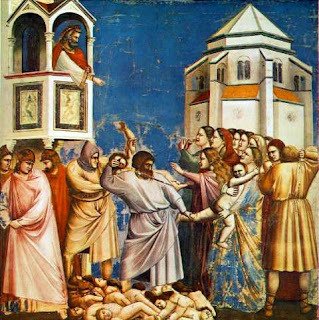 Here is Giotto's "Massacre of the Innocents." I Want to Direct Your Attention to . . .